Theatres Tilburg commissioned Studio Samira Boon to create a site-specific installation of Archi Folds in its main concert hall. The installation was inaugurated on 8 September 2018, during a special gala of Stichting Kunst en Onderneming Brabant (KoBra), marking the start of Theaters Tilburg’s 2018/2019 season. Thanks to its shape and adaptability, Archi Folds able to transform the large main concert hall of Theatres Tilburg into an intimate space suitable for smaller concerts and gatherings. Buildings are generally created to be permanent. By contrast, Archi Folds can bes een as a next step in creating a more flexible architecture. Archi Folds creates a dynamic and flexible environment, a so-called ‘open infrastructure’ as well as an eye-catcher representing the cultural programme of the theatre. The installation perfectly complements the hall’s architecture by Jo Coenen and interacts with Peter Struycken’s light artwork, resulting in ever-changing configurations and colour effects. ArchiFolds is an innovative series of textile structures inspired by traditional Japanese folding techniques: “Embedded origami patterns afford natural movement characteristics, growth and metamorphosis” explains Samira Boon. The textile structures are the result of extensive and ongoing research by Studio Samira Boon in collaboration with TextileLab / Textile Museum Tilburg and Prof. T. Tachi from the University of Tokyo. 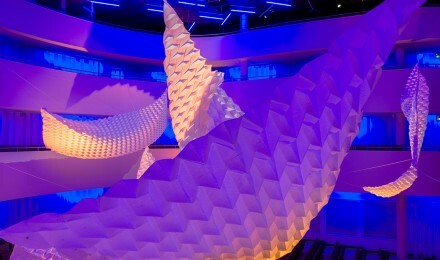 By translating traditional paper-folding into digital weaving techniques, she created architectural interventions that are extremely flexible in their use and possibilities. The woven structures can be folded and unfolded into different shapes, allowing two identical products to be installed in completely unique manners, re-used in different shapes and sizes, installed permanently or temporarily, and easily transported or moved. They can incorporate various smart properties that allow them to adapt to their surroundings -including light, heat or sound- while retaining a soft and tactile appeal. This is not the first intervention by Studio Samira Boon at Theatres Tilburg. In 2016, Archi Folds was already installed in the Audax Zaal of the theatre, and in 2013 the large-scale, flexible artwork and space divider Growing Caterpillar was installed in the main concert hall i.c.w. NEXT architects.